Always wanted fish as pets but didn’t know how to go about it? It may seem miniscule, but the chemical makeup of your water source can determine the life longevity of your fish. It’s unlikely that you will find chemicals like Ammonia or Nitrates, but you will be able to find out how acidic (pH) your water is. Most fish will adapt to the levels of pH, as long as the numbers aren’t too far off their usual pH. Be careful of chlorine, as your water source would need to be neutralized. If the chemical makeup of your water source needs to be changed, addition of chemicals can always be an option, although it can be considered last resort. It would be much better to put things in the tank that would affect the pH levels. For example, drift would be able to lower pH and soften water. Crushed coral, on the other hand, can raise the pH. 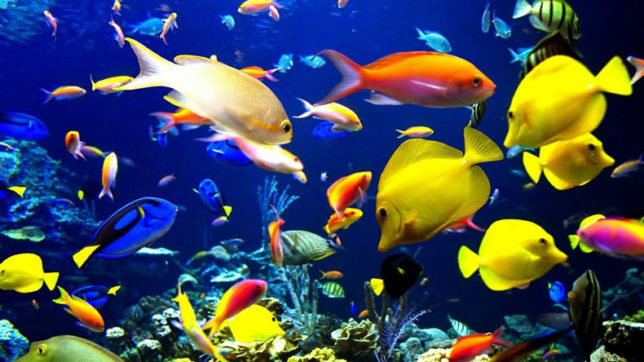 It can also be adjusted depending on the fish that you choose for your aquarium. Other than the pH of your water source, you will also need to make sure that your aquarium is properly cycled depending on the number of fish. Too much fish creates a greater need for healthy microorganisms (bacteria) to break down their waste. As a result, it would put a strain to your tank’s ecosystem and your fish might suddenly die from lack of healthy bacteria in the tank. It is therefore important to make sure you are not overcrowding your tank. The way to do it by adding the fish in a step-by-step process, not all at once. A water testing kit would be able to measure the amount of ammonia, nitrates, nitrites and pH in your tank. Ideally, your tank would have levels at around here: Ammonia=0ppm, Nitrites=0ppm, Nitrates<25ppm, pH=neutral. Goldfish and certain other cold water species are the only type of pet fish that could live in a variety of water temperatures. Tropical fish would require constant water temperature between 75° and 80° F. Consider the lighting for your aquarium as it brings out the natural colors of your fish and is necessary for live plant growth. There are many types of lighting you can choose from depending on your needs. Important point: too much lighting will trigger the growth of algae, try to limit lighting from 7 to 10 hours a day. You can plug your light fixture to a standard timer. Tropical Fishwater Tank: It is the most common type of aquarium which uses both tapwater and other freshwater source. For tropical fishes, a heater is also available to maintain the temperatures. There are many types of colorful fish that you can choose to inhibit this kind of tank. 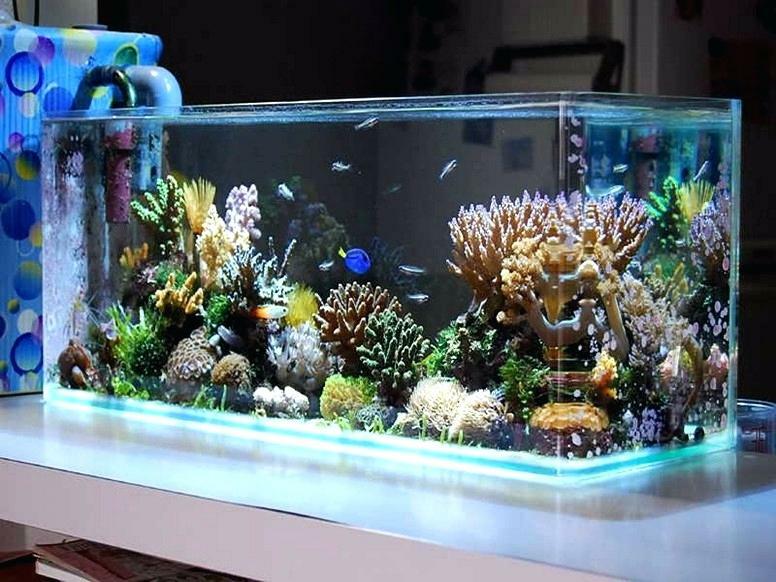 Cold Water Tank: This type of aquarium is less common but still popular. The types of fish that is generally put into these types of tanks are generally goldfish. However, the increasing popularity of keeping fish as pets has created the wider variety of cold-water fish to be available. Marine Tank: This type of aquarium uses seawater and is equipped with a heater. To obtain seawater, you will need to buy some sea salt mix into your tap water. Fish that inhibit these tanks are generally reef fish, as they are the most colorful fish available. Beginners are not recommended marine tanks, as it is much more difficult to manage than the other two aquariums. Ideally, you should place the aquarium inside the house, in any low-traffic area, or under a covered terrace – direct sunlight will heat up the aquarium and cause algae build up. Just make sure your aquarium is stable (on a wrought-iron stand, you can put a thin layer of thermocol below to keep it steady). Nowadays, aquariums come with customised wooden stands. You’ll need to invest some time in readying your pet’s home. The first step is to get your container. Wash it thoroughly, and then make a base with pretty pebbles or sand. Add bigger stones but, create an area such that the fish find some “me space.” Add upto 0.5 kg of gravel for every gallon of water. Make sure that your gravel is clean before being added to your aquarium. One way to put water into your tank without disturbing the gravel bed is to place a clean dish on top of the gravel. Slowly, pour the water over the dish. In this way, gravel bed that you have meticulously constructed will not be ruined. Afterwards, add corals, seashells and water plants. Put in the plants – their roots should be immersed in the sand or pebbles; support them with stones. Before adding tap water into your aquarium, always treat it with a dechlorinator, as plain tap water could kill your fish. Put in the fish after a few hours, to allow the environment inside the aquarium to settle down well. An electronically-operated aerator is another must for adding oxygen to the water–this thin plastic pipe is attached to a “weight” which disperses bubbles when immersed in water. All aquariums come with a “cover”, on which you can install a bulb or a small tubelight/under water light when you want to see your fish at night. It’s entirely up to you – you may opt for a variety of colourful fish, or stick to just one kind. Options include Angel fish (in silver or black) Black Molly, Red Swordtail and Gold fish. Guppies are peace-loving and prone to multiply if they’re comfortable in their “home.” Fast-moving fish such as Tigers and Kissing Guramis can also make interesting additions. Avoid getting a pair of Fighter fish – these look great but fight amongst themselves, often killing each other. If your fish are breeding, don’t add Shark fish to your aquarium – it eats up the babies! There are many varieties of fish food available in the market. Dry worms are most popular since they provide ample nutrition. Feeding fish once a day is enough but set a time for it. You may change the water once in 2-3 months. The fish themselves do not require any other care. In order to adapt the system to the tank, let it be operated for at least 24 hours before adding the fish. Afterwards, add two fish about 24 to 48 hours after the tank has been filled up. Putting the fish in also requires a certain method, in which you put the closed bag og fish into the water. Wait 15 minutes for the water to match each other’s temperature and finally release the fish into the tank. Try to do ammonia/nitrite tests and change the water on a daily basis. The chemical composition of the water will change on a daily basis as the fish will start to excrete feces. If there are not enough bacteria in the water, the water will turn poisonous because of the waste and the fish will suddenly start to die. It is therefore necessary to wait until there is enough bacteria in the tank, then add a couple more fish in. If the levels of ammonia/nitrite start to increase, then change 25% of the water with dechlorinated water at the same temperature. Every two to four weeks you will need to change your filter cartridge and change 25% of the water. You will also need to vacuum the gravel to remove any buildup of waste. The easiest way to accomplish both of these tasks is to use a siphon-operated gravel vacuum. An easy sign to know when your aquarium water needs changing or when you need a new filter cartridge is when the water in your aquarium turns cloudy, is yellowish or smells bad. If the problem persists, it can be because there are too many fish in the tank or because you’re overfeeding them. 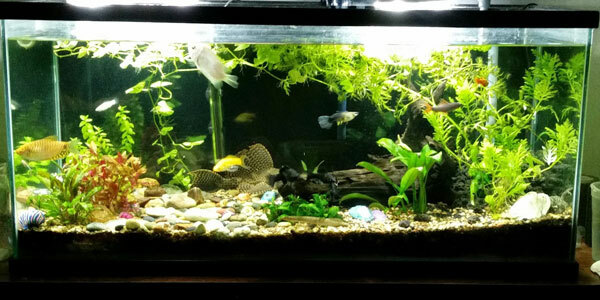 Do you have any other tips to start aquariums? Also do share your experience in the comments below!